Over the past six weeks, I have been engaged in battle – learning Biblical Greek grammar in just six weeks. This was very intense because we learned in just six weeks what is normally taught over one year. I now know why this class is called, ‘Gladiator Greek’. The amount of memorization required in this class in such a short period of time was particularly taxing and difficult. We not only had to memorize a lot of vocab but also umpteen charts and paradigms covering most aspects of New Testament Greek including the verb conjugations, noun declensions, participles and participle parts, adjectives, periphrastics, pronouns, infinitives and much more. The exciting part of this class, however, was the thrill of translating all of 1 John straight from the Greek New Testament bible. Going through the translation process brought all of what we learned in class together and being able to translate straight from the Word of God was a thrill. 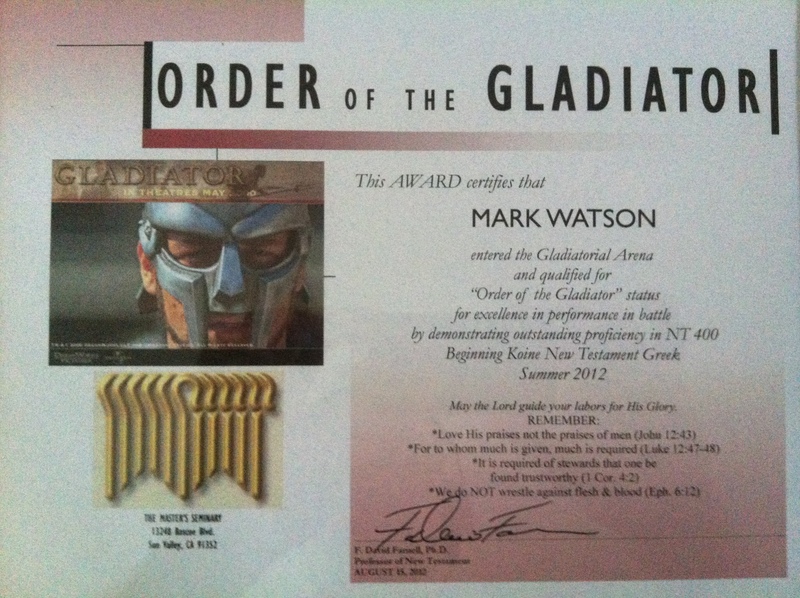 I am so thankful to the Lord who is using classes like Gladiator Greek to batter me and shape me into a person who can be useful to Him. Please know that pretty well every time I drive to work & come home again over the Woburn over-ramp, I find myself praying for you and your family – for all sorts of things – hopefully being lead by His Spirit. May God continue to bless and keep you my friend(s).